Selecting a sharpening stone can be difficult unless you understand the differences in stone materials. This short video will walk you through the advantages and disadvantages of various sharpening stones so you can find the best stone for your needs. The key to sharpening is having the proper tools for the job. That means selecting the proper sharpening stone and understanding the differences in stone materials. We'll cut through the confusion so you can find the right product to properly sharpen your tools and knives. The variety of sharpening stones available today is enough to confuse even the experienced sharpener, let alone the novice. I'll walk you through the differences in these stones so you can select the right stone for your needs. The three most common types of sharpening stones are oil stones, water stones, and diamonds stones. Each of these stones has its own advantages that can help you achieve your sharpening goals. First, I'll start with the oil stones. Oil stones are the traditional stones that many people grew up using and are designed to be used with oil. They are made of man-made materials or natural quarry stone. The man-made stones are made of aluminum oxide such as this India stone, or silicon carbide like this Norton crystalon stone. Both of these stones are available in coarse, medium, and fine grits. Oil stones also come from natural quarry stone. The natural quarried stones are called Arkansas stones. The Arkansas stones are even finer than the man-made stones. The coarsest of the Arkansas stones is the Washita, followed by Soft Arkansas we have here, Hard Arkansas, Hard Black Arkansas, and finally ending with the finest of the stones, the Hard Translucent Arkansas. Overall the oil stones represent a good value. The man-made stones are the least expensive of the stones available. The natural stones can be a little more expensive. Oil stones tend to be harder than water stones, which makes them cut slower. The fact that oil is used to float away the metal filings also makes them more difficult to clean up. Next we'll cover water stones. Water stones are newer to the western world but have gathered a large following due to their many advantages. Water stones like this Norton stone are made of aluminum oxide abrasives. This is the same material used in the India stone, however the difference is in the binder that holds the stone together. The water stones are softer stones which promote faster cutting because the old abrasive material breaks away and is replaced with fresh sharp material. Faster cutting is a clear advantage of the water stone. Water stones are also available in finer grits than the oil stones. Using water rather than oil for sharpening is preferred by many. The last stones I'll cover are diamond stones. Diamond stones contain small diamonds attached to the face of a metal plate. These small diamonds are much harder than other sharpening abrasives. This DMT Diamond Whetstone uses quality mono-crystalline diamonds for faster sharpening and longer wear. The interrupted diamond surface of this stone traps the metal particles while sharpening. Diamond stones are also available in a continuous diamond surface such as this DMT DiaSharp stone. This continous surface is preferred when sharpening small or pointed tools. Diamond stones are fast cutting and their surface remains very flat. Diamond stones also use water for sharpening making it easy to clean up. Diamond stones may cost a little more, but they are versatile and easy to use. There are good reasons why there are different types of sharpening stones available. There is not one type of stone that is best for everyone. Selecting the right stone starts by finding the stone with the best combination of advantages for your particular sharpening need. What is an India Stone? 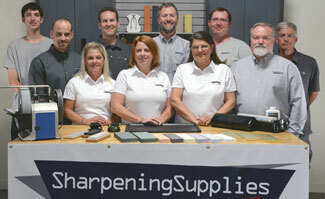 Questions about choosing a sharpening stone?